*Fix for older PHP versions. * WPezTheme codes to optimize the theme. * Improvement for the index page options. * New index page options to set the mast for the home index page. * Further style fixes for mobile. * The parallax feature now works on mobile. * New option: Allow iframe in posts to break out full width. * A new option to show the excerpts of posts. * Character component style fix. * Alternate option for \"Featured Video\"
* Automatic mime type for \"Featured Video\"
* Submenu and Subtitle support added. * \"Featured Video\" has been added to the Edit Post page. * previously, the maximum featured image width was restricted to 1200px. This limit is increased to 2048px for non-mobile devices. * changed the behavior of the featured image on mobile devices. * Changed the media query breakpoint to 768px and fixed the menu overlay so that it scrolls if large number of items. WARNING! This update includes support for Aesop Story Engine 1.4 being released on Wednesday 12.17.2014. This update to Aesop removes the metabox library that we use to create the story options in the posts here in Novella. So, you\'ll be instructed to install a plugin called CMB2. However, you don\'t have to install this until after you update Aesop Story Engine to 1.4. We\'ve made sure that everything should be backwards compatible, so please let us know if you have any issues, bugs, or queries! * Added by popular request, an option to enable a \"parallax like effect\" for single posts that have a featured image set. Enable within Customizer. Owners Manual also updated. NEW! Home Index page mast options. NEW! “Featured Video” support for posts and pages. Look at the example featured video page. Novella is a breathtakingly gorgeous storytelling theme for WordPress, with full support for Aesop Story Engine. Novella will make your stories look amazing with its crisp typography, coordinating colors, and precision details. Customize Novella with a couple of default colors to match the look that you’re going for. And, with individual story accent colors, each story can have a life all it’s own. Take a test drive and see for yourself. NEW! Search Icon: You can add the search icon to the menu bar by enabling it from the Novella options menu. NEW! Reveal Animation: You can add the reveal animation to the index page by enabling it from the Novella options menu. Writers and authors will appreciate Novella’s ability to sell your stories with built-in support for Restrict Content Pro. The Novella front page features a stacked grid where you can use a background image (or color) for each story. One of the coolest features is the animation effect displayed at the top of each story that progresses as the reader scrolls down the page. Take a test drive to see it in action! You can use the top post as the mast for the home page. Or you can use custom settings. New option to enable reveal animation effects for the front page and archives. New options to design the look of the mast. You can change the tint color of the featured image, enable caption overlay, change the width/height ratio of the mast, or remove the mast altogether. You can use the default width/height ratio or 16:9 or full screen size. Change the width/height ratio of the mast. Change the tint color of the featured image by changing the "Accent Color." Hello, I’m very interested by your new theme Novella. However, I have some questions to ask you. – I’m testing your “Drive test” and I can’t find how to create more than one collection? In the menu settings, I can’t find any page, category or post name named “collection”. So I don’t get where to add other collections in the menu? – Is there an easy way to change fonts and design option? Or will it be possible to use CSS to modify the font family? Like using google fonts for example? – I speak french and all the texts will obviously be written in French. Is there any .po and .mo available to change the langage of the site? – Is there any contact form? 1. The collection component is part of Aesop Story Engine. A “collection” is a category, and the “collection id” is simply the category ID. You add a collection by using Aesop Story Engine within a single post. 2. Novella includes two options to change the link and accent colors. Fonts and things can be changed easily with 3rd party plugins. 3. Yes! This next update has .mo and .po files for translation. 4. Nope! But that’s something that can be handled by a third party plugin pretty easily! 1) Do you provide any child theme? 2) How large the images must be? 3) I’m sorry but I don’t understand the collection options. I tried to create a collection in a single post with 5 columns. But when I click on the post, the related posts are displayed in one single column and they stick to the left of the screen (without margin and without photos…). Did I miss something? 4) About the images, you said we can pick a color instead of an image. But I don’t see any option to change the image to a color…? 6) And last one I promise…. I changed the color options in the novella customization panel but the “load more stories” hover state stays in the original grey-blue color and so are the “post your comment” buttons. Is there a way to change that or will I have to add css classes ? Thank you a lot in advance (and sorry about these numerous questions 😉 !!! 1. No we do not but the owners manual covers how to create one. 2. It depends on where you are using them. 3. Did you provide the collection ID? happy to help further in the Aesop support forum. 4. You can pick an accent color for each post, but there are no options to change the image colors. 6. This may be a bug and we can definitely look into it. While there aren’t any built in options for that, you could definitely achieve that with some custom CSS to put them into a grid. Hi! I was searching for long-read theme and Novella is a perfect choice. But I wonder whether it supports basic WordPress features like search, tags, category archives? It wasn’t clear from the live demo and sandbox. Yep Novella adheres to WordPress best standards for themes so it definitely supports category archives. There isn’t a search anywhere in the design but is super easy to add. Also, each post has a category above, which, when clicked, will show those categories. 1. Could one set a full width parallax image with caption wherever one wants in this theme..? 2. Could on set full width images with a caption that follows one another? 3. Could one put a animated text on a full width color or image bottom? 4. In Novella – could one start with a background image (or parallax) full width image instead of a fixed image? 5. Is the themes W3c validated and good on SEO? 4. 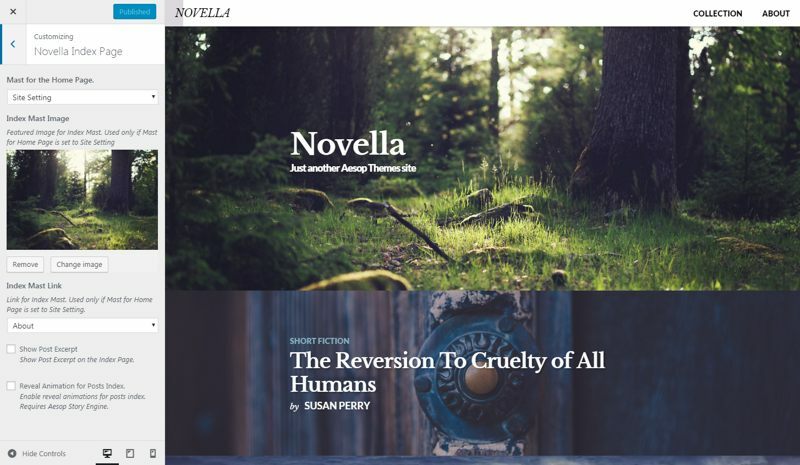 With Novella the top of each post is a fixed image that is responsive across all devices. 5. It absolutely is! Feel free to run it though the validator to see. Regarding SEO, there are a lot of plugins out there than can take care of this part. Suggestion: If one could do a parallax instead of a fixed image at the top – the Novella theme would have it all…? There´s a certain magic to start off with the parallax instead if to scroll a page. See what I mean..? It would be very nice if one could have that option in a future update of the theme. Last Q: Could you help custom the theme in this fashion mentioned above…? Re-Hello, I was ready to buy your theme but I just want to be sure about the licence. You say in your refunds policy: A valid license is required for updates and support. So it means that after one year, I would need a new license key to have updates and support, but we agree that the licence of the theme itself will still be available next year, after the first year of using it? I mean, I won’t have to pay again to use the theme itself next year? Hi Sophie! Yes that is correct Themes and add-ons receive one year of support and updates, after which time you can renew your license for 30% off. Your theme/add-on will continue to work indefinitely. is it 30% (?) or 50% (according to your refunds policy) of the original cost of the product? – Would it be possible to remove the menu header with the progression effect completely from the theme? I’m guessing some coding might be needed? – Is there any way of making the top image of a story parallax instead of fixed like in the Jorgen theme? Sure with some custom CSS you could apply a display:none to that if you’d like. Regarding the top being parallax, we’ve had this request before and may end up updating the theme with an option to enable parallax movement on the header image. Thanks Nick for the quick answer! Just like some previous people have mentioned this really would be the perfect theme (for me at least) if you would update it with support for parallax top images. I guess you wouldn’t have a timeframe for a possible update would you? I’d say right now if you would get this updated I will pledge to buy the theme. When you say “parallax top image” do you mean, how, for example in in Jorgen the text content slides up over the image when you scroll down? Yes exactly, sorry if I’m using the wrong terminology. We’ll have an update out this week for this feature as it’s been requested quite a few times. That’s awesome news! Thanks for getting on this so quickly, will purchase theme as promised in the end of the week then. Will it be announced in the changelog or could you give me a notice when it’s been updated? Hey Elias! Yep we’ll make an announcement on Twitter and the version here will update automatically. I have this feature completely, and just thoroughly testing it before we make it live. It will however go out today. Hi Nick. I’m interested in Novella, but I want to re confirm some things before. 1.- Does this template allow embedding video (Vimeo, YouTube) anywhere with HTML code? What about adding a SoundCloud archive? 2.- Is there any restriction with the extension of text in a post? 3.- Can we embed interactive infographics? I see in another theme you made (http://blogs.detroitnews.com/specialreports/2014/06/25/white-lake-moves-beyond-toxic-past/) that it is possible to embed interactive maps and timelines with HTML code. Yes to everything! Our themes follow standard protocol for WordPress themes so you can definitely embed anything you like! P.S – We have a really cool timeline add-on coming out soon that looks very similar to that! Hi, can i buy the Theme with paypal? Your system not accepted my german master card. Hi! We have quite a few German users and international clients. Simply provide a State or Province within the Billing Address. We do not offer Paypal as a payment solution at this time. Are you seeing any specific errors? I have the same question with Schoenbach. May I buy this theme through paypal? My credit card doesn’t support for international transaction. Thanks. We do not support PayPal at this time. Our system can handle international payments as we have many international users. Choose any State on checkout and you shouldn’t have any issues. Thanks for your kindly answer Nick. Here I have 2 more questions. 1. Is it possible to install novella on multiple domains? And 2, how do we protect the source code since, you know, the heart of the story is content? When someone could access the source code, they can copy the story, right? Yes you can use Novella on multiple domains. To answer your second question, there’s no way that exists that I know of that would prevent someone from stealing your copy. That’s just something we have to deal with when sharing information on the internet. This would be the same with any WordPress theme that you purchase. Thanks Nick. It’s very helpfull. No problem! Please let us know if you have any other questions, happy to help! Hi!! Is the home page “customizable”?? I mean, can I set the home page to be a “page” or a especific “single post”?? Hi there! You can use your blog page or a single page as your home page. Hope that helps! i would like to buy the theme but i have one question. it might refer to ignacio’s but for me it is not clear. You can have a static page and then a different page set for your blog posts as displayed in the customizer settings. However, You can only do what you are asking about with Jorgen and Jorgen Story Front. Otherwise, that type of design is not available out of the box with Novella as we like to keep our themes focused, clean, and lightweight. Is there a way to change the Novella home page to a grid, rather than stacked? I like the way that the home pages in Jorgen and Kerouac have grids, but like the way that Novella displays stories. Thanks! Sorry for the delay in this reply! You can likely do this with the Collection Grid in Aesop/! I’m interested in only using AESOP for 3-4 specific “posts” a year on my current website. From what I can tell, AESOP seems to be an all or nothing look for a website. In order to maintain my current website structure / theme / look and feel….. Would you suggest using AESOP on a subdomain? With it’s own WP install and AESOP theme? If you want to use Novella alongside your own WP install, you can search for a plugin that allows you to set a theme per page. Another question…. does it work with the Studio Press / Genesis platform? I can find only a few references from early 2014 where other bloggers have stated it doesn’t work. Has this changed during the last year? Thanks! Sorry for the late response. It can and does! Check this out for Genesis theme compatibility – add this code snippet here: http://aesopstoryengine.com/quick-start-guide/ and then for full screen components: https://gist.github.com/bearded-avenger/f478639cbf0847c48230. Hey Jonathan, sorry for not getting back to you till now. Hi guys, just before buying this theme, I would love the ability to export the ‘posts / books’ as epubs / pdfs, is this possible, or do you know a plugin that will work for it? I want to enable my users to post stories with photos on my site. Can you tell me if this possible? Is this someone that your plugin Lasso can do? I found two plugin that can do it (Frontend Publishing Plugin and Frontier Post) – But are those compatible with Novella? Thank you! Hey Theis! I think we were able to resolve this via email. Let us know if you need anything else. With Novella the focus is on typography, making your writings stand out above the rest. Designed with longform in mind, Novella features a subtle progress bar denoting the length of each story. Full compatibility for Restrict Content Pro. Sell your stories on your on site, even subscriptions. Novella was built from the ground up to be compatible with all mobile and tablet devices.